The Pixy camera sensor board, being developed by Charmed Labs and Carnegie Mellon University, can detect objects based on seven colors, and then report them back to a computer. A Kickstarter campaign was launched on Thursday to fund the US$25,000 project, and the organizations are on pace to reach full funding by the end of the day. Adding the Pixy could be viewed as giving robots basic vision, said Rich LeGrand, founder of Charmed Labs. "Once you have vision, then you can introduce the idea of tasks," LeGrand said. 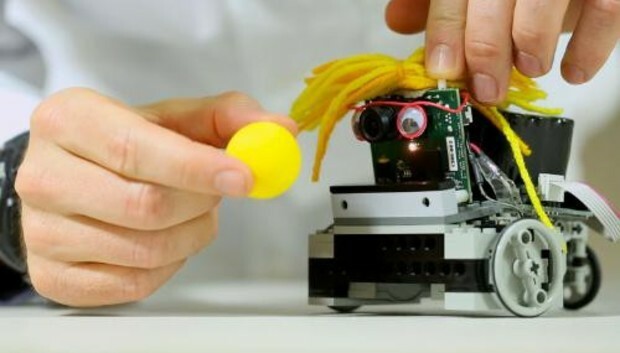 "If you want a robot to charge itself, that's a simple example of a task. This will get you there. If you want to a robot to navigate, this will get you there." The camera can recognize simple items based on color, like a purple dinosaur, or a green ball. Objects are also recognized by specific color markings or codes. For example, a power outlet can be recognized by the Pixy when specific color stickers are placed next to each other on the object. Interestingly, the color-coding mechanism is also used in Mumbai as a low-tech way for the "dabbawallas" -- or people delivering lunch boxes -- to figure out where food needs to be delivered. The Pixy can also be "taught" what to recognize based on color codes, and algorithms for that can be programmed into the board. A software called PixyMon, which works on Macs and PCs, processes the algorithm and visual information received from the Pixy and reflects the image and objects on a screen. "If you're willing to color tags and objects that you're interested in... this is a great sensor. It'll find these objects, it'll find hundreds of them, and it will give you the results back," LeGrand said. The robot can deliver the results back to a computer through multiple output mechanisms, giving hobbyists many ways to process information. Pixy has ARM-designed Cortex-M0 and Cortex-M4 cores, a 1280 x 800-pixel sensor, 264KB of cache and 1MB of flash storage. Robots based on the popular Arduino microcontroller can be hooked to the Pixy, LeGrand said. The hardware can process images with a resolution of 640 x 480 pixels at 50 frames per second. It's possible to track basic images in real time, and the image processing doesn't bog down the CPU, LeGrand said. Cameras have been a part of robotics since the 1990s, but expensive to implement, LeGrand said. His goal with the Kickstarter project is to buy parts and make a cheap camera accessible to the wider robotics and hobbyist communities. The project will also fund the development of future versions of Pixy, and he has the backing of the respected robotics department at Carnegie Mellon. "I thought hey, try to keep to keep the cost down, keep it robust... and people would use it for different projects," LeGrand said.